Where are PlayBook users from? The PlayBook is seeing a much more diverse installation base then when I looked at it last year. While the United States, Canada, and the United Kingdom combine for 71.6% of users, another six countries held claim to over one percent of the instal base, and downloads were seen from 142 different nations. 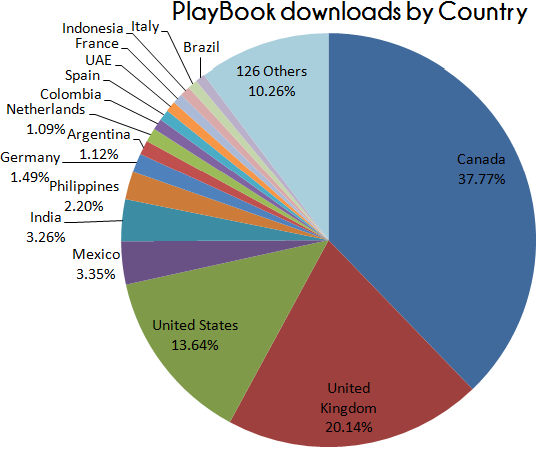 The PlayBook continues to have an outsized popularity in RIM’s homeland of Canada, accounting for 37.8% of users. The PlayBook also showed surprising popularity in India and the Philippines, which both saw a higher share of PlayBook users than traditional BlackBerry hubs such as Indonesia. The vast majority (83.93%) of these users have English as their primary language. 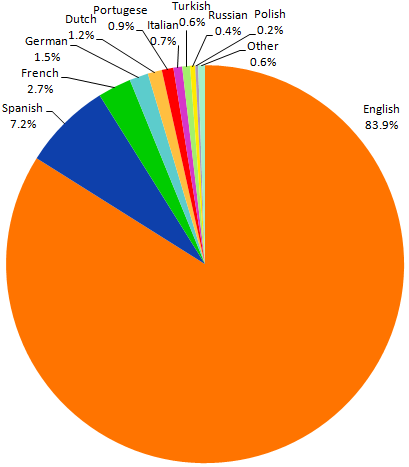 The next most popular languages were Spanish, French and German. 96.5% of PlayBook users are running OS 2.1.0, and well over 99% of users are running some version OS 2.x on their devices. For more details see yesterday’s post on BerryReview. These statistics are generated from PlayBook downloads of the strategy game Xploding Boxes, from September 1st, through December 31st. Data was collected by BlackBerry AppWorld at the time of download.